I do think there is something like a handwriting to my cooking. Anyone who eats regularly at my house (or reads this blog) will notice a certain inclination or even fondness for things like egg yolks, lemon (a lot), salt (even more), making toasted spice rubs, and braising. It’s fair to say that I have a steady repertoire that I like to go back to, regularly, maybe even a bit too often to win a creativity contest. However, I love to revel in culinary eclecticism. One day, I want to prepare and giant beef heart and stew with fistfuls of spices, the next day I want the cleanest seasonal vegetable salad, then just piles of deep fried stuff – or I just clean out the fridge and see what happens. Cooking and eating to me are about versatility and variety. So I try to keep my eyes open in all directions when looking for cooking inspirations. A few days ago, I spoke to my friend Maria on the phone, and she told me she was going vegan until further notice. I wasn’t surprised much – I’ve known Maria as a (temporarily: fellow) vegetarian for as long as I can remember, and while I went back to eating animals a year ago (the diet – not the book), she just took a step in the opposite direction. Although I do eat meat again, a lot of what I eat or cook is vegetarian, occasionally even vegan, as I realized when checking the ‘vegan’ tag before uploading posts to the blog now and then. As some of you might now, I’m not a big fan of the whole health- and powerfood gospel. I believe in intuitive eating. If you need it – you will crave it. Even if it’s not stereotypical ‘healthy’ food. What ever it is: it has to be tasty. 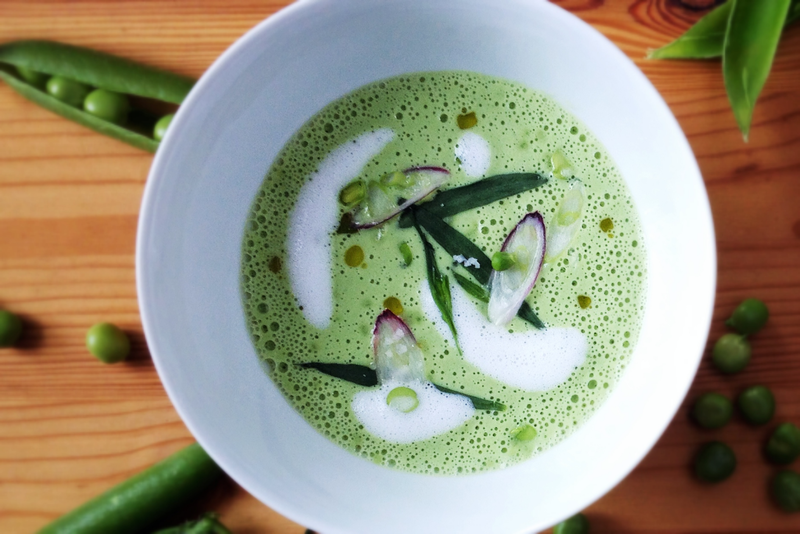 So when Maria and I chatted about dairy substitutes, my head started to come up with this idea of a soup that would tick all the current health food boxes, but which I would still find delectable and consider something I would do again and again, even when I wouldn’t be looking for a health injection. Also, I wanted something suitable for the already up and running summer: light, refreshing, quick and simple to prepare. I wanted to make a soup, but a chilled one. Plus: I didn’t want any cooking involved in the process. I love gazpacho. In my version, I like to add a big chunk of watermelon and some sherry vinegar to the blend(er). Also, I put some white bread into the mix for a silky consistency. For this recipe however, I was not in the mood for something tomatoey, bold, acidic. I wanted something elegant, something clean and fresh, more sophisticated than rustic. When I was wandering around the farmer’s market this morning, I saw fresh snap peas. They are in season right now, and bring a delicate flavor and moist creaminess when blended. I took a few handfuls home. 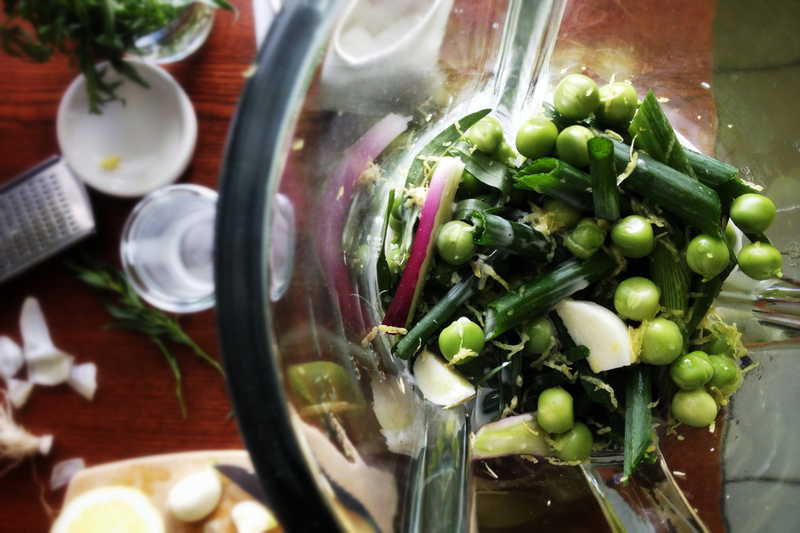 An important note: make this recipe with raw peas only (!) if you can get some really really young ones. Otherwise the soup will become a grainy dull mess, and everything I always imagine a ‘green smoothie’ to be. 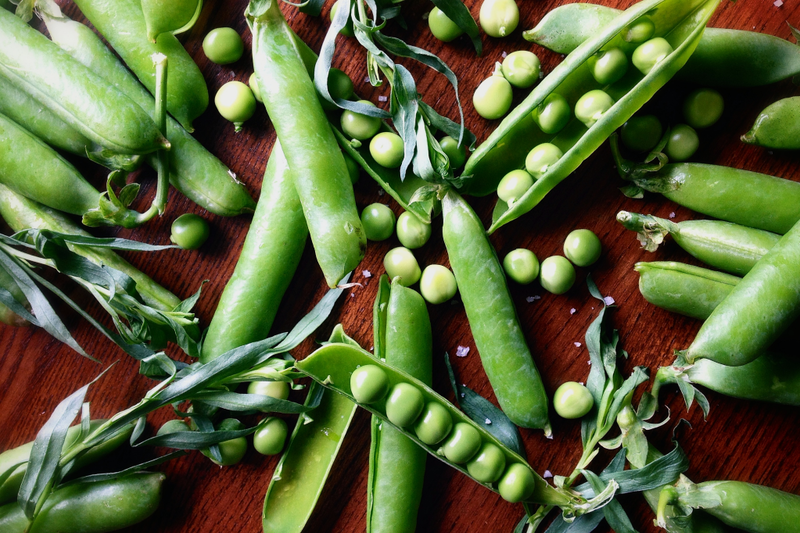 If you can’t get really tender peas, this recipe works just as well with cooked ones, but makes for a different (yet equally pleasing) flavor and texture. For luxury, I added some coconut cream. As I didn’t have the drive to make my own (which I have seen people doing in various blogs, and which I’m intrigued about doing with almonds in the next days), I went for an organic store-bought coconut cream. One of the classic herbs to go with peas, of course, is fresh mint. And this soup would work just as well with it. But I just love the mysteriousness and licoricy scent of fresh tarragon, and I think it goes so exceptionally well with the flavor of coconut that I grabbed a bunch when heading home. 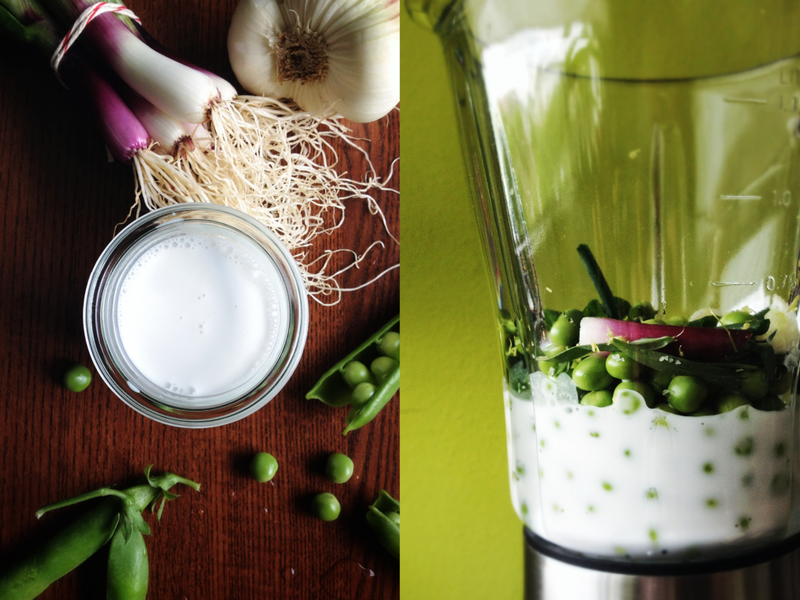 From there on, it’s just a matter of a few other ingredients, about 10 minutes of your time (5 when the peas are already shelled), and 1 good blender. The result is a creamy and distinctively flavored soup that is great as a starter, for a garden party, or even – if you dare – as a sauce with some panfried white fish. Put all the ingredients in a good blender and atomize. Chill thoroughly and serve cold. This looks super yummy and healthy. A perfect summer dish. AND beautifully photographed, may I add. mhmm das sieht einfach köstlich aus!! We made this soup in our Harvest food night, and it was a hit. Guests also wondered if it would go as a morning smoothie!